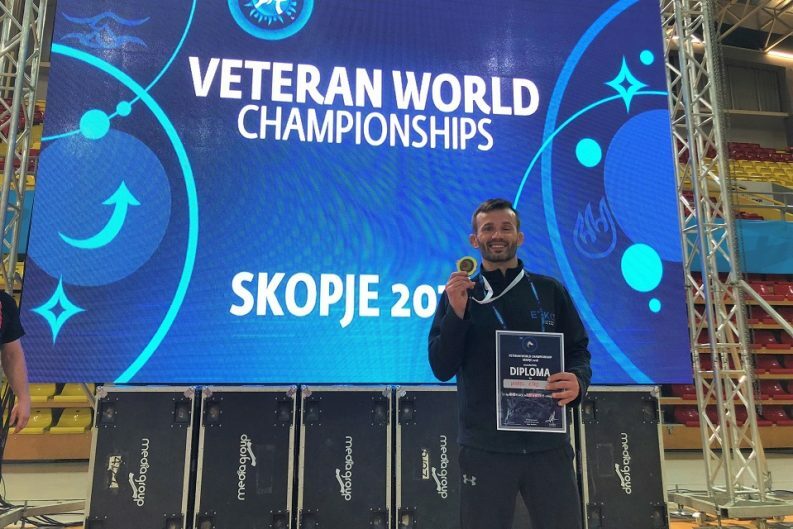 North-east wrestler Viorel (Vio) Etko struck gold on the global stage at the weekend by clinching the top podium spot at the Veterans World Championships in Skopje, Macedonia. Vio (40), who is based in Oldmeldrum, was competing in the category A (35-40 years) 62kg division. His gold medal win, which follows a silver in the same event last year, was achieved after winning several challenging rounds, culminating in a gruelling final against Russian wrestler, Aidyn Irgit. Commenting after the event, Vio said: “Having sustained an eye injury in the earlier rounds, I knew I had to be completely focused during the final. My opponent fought extremely hard, so I needed to be very tactically aware, as well as being physically prepared. Vio’s passion for his sport has already translated into a highly successful wrestling programme, which he runs at ETKO Sports Academy in Oldmeldrum. The organisation has over 60 young wrestlers across its Mighty Movers and Wrestling4All sessions, which are aimed at boys and girls at different school stages. Vio is also head coach for ETKO Wrestling Academy, a club for young wrestlers who demonstrate the appetite and ability to compete at junior level. In addition to his new veteran world champion status, Vio’s achievements to date include a Commonwealth Games bronze medal in 2014 and seven British titles. In 2017, he was a winner at both the English Senior Championships and British Closed Championships. ETKO Sports Academy offers a variety of coached sessions, classes and activities for all ages and abilities. The company, which employs 30 people, coaches more than 1000 members per week and is committed to helping people achieve their sporting potential and encouraging long-term participation in sport.